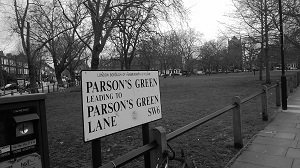 Today Spick & Span window cleaners went down to Parson’s Green SW6 to window cleaner for the owner of a raised ground floor flat in a Mansion block on the busy New Kings Road in SW6. The windows of this two bedroom property had not been window cleaned for several years and so the windows were extremely dirty and required very rigorous window cleaning. Spick & Span window cleaners took just 30 minutes to arrive at this property in Parson’s Green from their window cleaner home base in South London. Once on site at this Parson’s Green flat, Spick & Span window cleaners assessed all the windows in flat that required a window cleaner, and after this was done window cleaning commenced at the rear of the property, which housed five original sash windows. To clean the windows at the rear of the Parson’s Green property permission had to be sought from the downstairs neighbour and a key had to be obtained, to access the rear of the Parson’s Green property, which was done through a side gate. Spick & Span window cleaners used a portable water-fed pole window cleaning trolley to transport the water that as used in the window cleaner job in Parson’s Green, and used a carbon-fibre telescopic pole and a very abrasive window cleaning brush, this method was the most practical. Because of the length of time that the windows had not been cleaned, each window had to be scrubbed repeatedly to ensure that the dirt was removed, particular care was made to reach the corners of the sash windows where dirt has a habit of sticking. After this was done the windows, were all rinsed clean, exposing the room within once more, a making the windows of this home in Parson’s Green like new. The neighbour in the basement flat below was concerned about water dripping onto his windows , but Spick & Span window cleaners promised that all drips would be wiped from his windows at the jobs completion, which he was very happy about. At the front of the property there was a well used footpath, and so to prevent risks to pedestrians Spick & Span window cleaners ensured that the window cleaning hose was carefully placed, and a high visibility sign was placed on the footpath to alert pedestrians to the dangers. The sash windows at front of this Parson’s Green property were scrubbed and rinsed, the frames were also cleaned as were the window sills. In all despite the thick dirt and terrible conditions of the window the total time taken by Spick & Span window cleaners to clean the windows of this flat in Parson’s Green was one hour. To ensure that the window cleaner work done met with this Parson’s Green homeowners approval the work was inspected from inside the flat and afterwards the payment was received.